After 10 Lashkar-e-Toiba men sailed into Mumbai to expose India’s lack of preparedness, the country announced a project to install 46 coast-based high-frequency radars all along the 7,500 km Indian coastline under a Rs 602-crore project. The second part of the coat security network involved installation an automated identification system (AIS) for all sea-going boats. This envisaged setting up of radio frequency-based AIS transponders on all boats weighing below 300 tonne. Shore-based sensors (around 85) would then automatically pick out a boat with complete identity of the owner flashing on screen. The project is still being “studied” jointly by the Director General, Lighthouses, the Coast Guard and the Department of Fisheries, a senior functionary said. Almost all under-300 tonne boats are fishing vessels and one such vessel was used by the 10 attackers to reach Mumbai. Vessels over 300 tonnes have an AIS. The island territories of Andaman Nicobar and Lakshadweep were to get 10 of the 46 radars as these lie very close to the international sea lanes of communication (SLOCS). Over 80 per cent of the Indian trade takes place through the sea route. Sources said work of planned radar stations at Chennai and Kolkata was running behind schedule, while not even one of the 10 radar stations on the islands had become functional so far. The radar station at Vishakapatnam was opened last week. Defence Minister AK Antony today told the Lok Sabha that “in the first phase, 46 radars (36 on mainland and 10 in island territories) have been planned which are envisaged to be fully functional by middle of next year”. The first two radars were installed on the west coast in July. Antony, sources said, had set a target of November 26 for covering the entire mainland. These powerful long-range radars can spot even small boats and instantly beam information to the ground-based controllers in the form of live pictures. India and China today signed four MoUs in the areas of energy efficiency, railways, planning and IT. The memorandums of understanding were signed during a day-long second India-China Strategic Economic Dialogue here. The first agreement was signed between the Planning Commission and Chinese planning body National Development and Reforms Commission (NDRC) for undertaking joint studies in economic policy research and development planning. An MoUs were signed to encourage cooperation between India's Bureau of Energy Efficiency and the NDRC. Another MoU was inked between the Indian Railways and China's Ministry of Railways for enhancing technical cooperation in the railway sector. Another agreement was inked by IT industry body NASSCOM and China Software Industry Association (CSIA) for enhancing cooperation in IT and ITES sector. Montek Singh Ahluwalia, deputy chairman, Planning Commission, invited Chinese investment in infrastructure in the areas of railways, roads and power. He also underlined the need to balance trade between the two countries which stands at $ 74 billion. Ahluwalia mentioned that while the current trade growth is driven by China’s exports of project equipment mainly in infrastructure, there is a need for strong vendor support for maintenance of imported equipment. In private sector, MoUs were signed between Reliance Power and Guangdone Mingyang Wind Power Industry Group Co Ltd for a 2,500 MW renewable energy project envisaging an investment of $ 3 billion with project financing from China Development Bank. Lanco Group has entered into an agreement with China Development Bank for financing $ 600 million Anpara Phase-II Power projects (4X660 MW). Striking down applicable provisions in government regulations, the Armed Forces Tribunal has ordered that all officers and men of the Territorial Army (TA) would be at par with regular Army personnel for the purpose of post-retirement benefits. While the Tribunal had earlier held that TA personnel were entitled to the same benefits as were being given to regular Army personnel, these orders were not implemented by the Controller General of Defence Accounts, which contrary to government decisions, had inserted clauses in regulations denying benefits to TA personnel. This led to a second round of litigation. While allowing a petition filed by Maj SD Singh and others seeking that the provisions that deny weightage for the purpose of calculation of pension to TA personnel be quashed and they be paid pension since inception by recalculating, as in the case of other Army officers, with weightage at the rate of 50 per cent of last drawn pay along with interest of 12 per cent per annum, the Tribunal ordered that besides the petitions all similarly placed persons be given the said benefits. Different “weightage” in terms of number of years is stipulated for different ranks for the purpose of calculating pension to offset the disadvantage of early retirement from services. 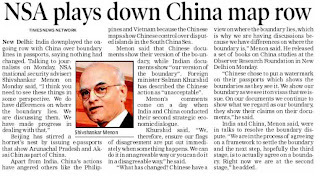 Amid the ongoing map row between India and China, National Security Adviser Shivshanker Menon will visit Beijing next month. Menon, who is India’s Special Representative for the boundary talks with China, will hold the 16th round of meeting with his Chinese counterpart, State Councillor Dai Bingguo. 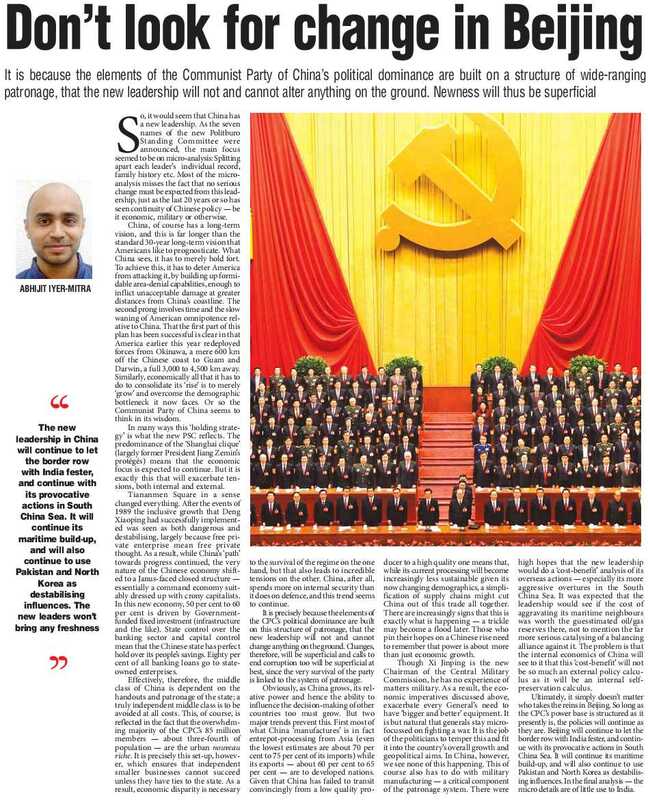 Informed sources said New Delhi was also exploring the possibility of a meeting between Menon and at least one of the top representatives of the new Communist Party leadership of China. The vexed boundary issue had figured at a bilateral meeting between Prime Minister Manmohan Singh and Chinese Premier Wen Jiabao in Cambodia last week on the margins of ASEAN Summit and Seventh East Asia Summit. 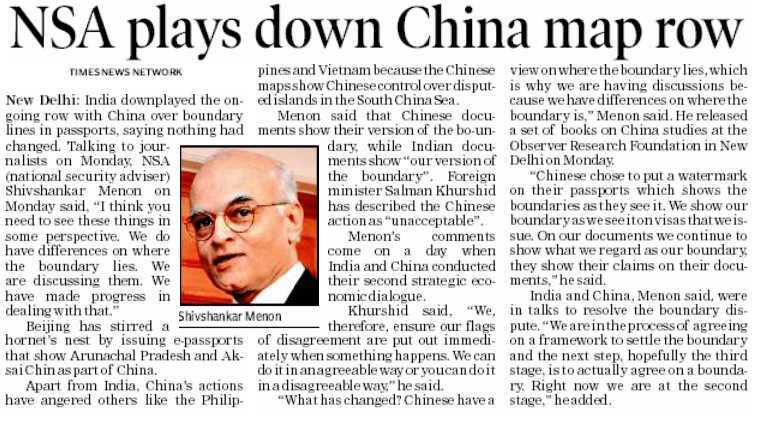 Menon’s visit assumes significance against the backdrop of the new territorial row that has broken out between India and China after Beijing started issuing e-passports to its citizens depicting a map that includes Arunachal Pradesh and Aksai Chin (in Ladakh) as part of China. As soon as it came to the notice of the Indian Embassy in Beijing, it retaliated by stamping these passports with its own version of the map, marking out its own territorial boundaries. On his part, Menon sought to downplay the issue today while addressing books on China at a function at the Observer research Foundation (ORF) here. “I think you need to see these things in some perspective. We do have differences on where the boundary lies. We are discussing them. We have made progress in dealing with that,” he said in reply to questions on the latest map depiction by China. Chinese documents show their version of the boundary while Indian documents show “our version of the boundary”, he added. “What has changed? Chinese have a view on where the boundary lies, which is why we are having discussions on the boundary because we have differences on where the boundary is,” the NSA added. “Chinese chose to put a watermark on their passports which shows the boundaries as they see it. We show our boundary as we see it on visas that we issue. So, what has changed. On our documents we continue to show what we regard as our boundary, they show their claims on their documents,” he said. 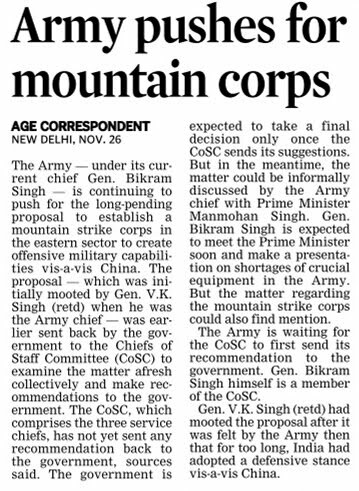 New Delhi, Nov 24/NationalTurk- Indian Army Chief General Bikram Singh Saturday ruled out withdrawal of Indian soldiers from Siachen, world’s highest battleground citing strategic importance of the place for the country. “India now has the advantage in Siachen and this should be maintained,” General Singh told media persons on sidelines of a passing out parade of the cadets at Indian Naval Academy (INA) at Ezhimala , Kannur. However, he was quick to add that it is for Indian Government of India to take a final decision. 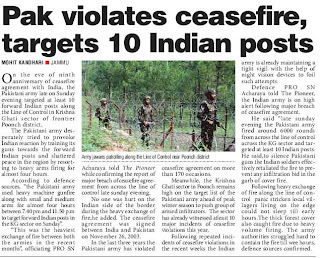 Earlier, on November 12 this year, Indian Defence Minister A K Antony had also ruled out withdrawal of Indian soldiers from the Siache. “Our stand on the issue is very clear. 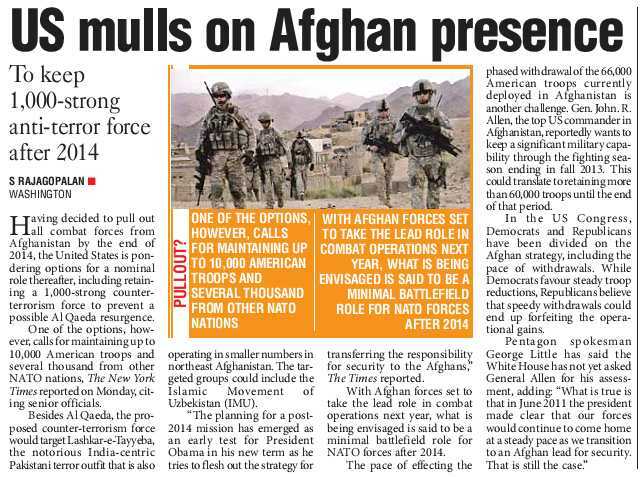 There is no change in it and we are not for its (Siachen’s) demilitarization,” he had said. 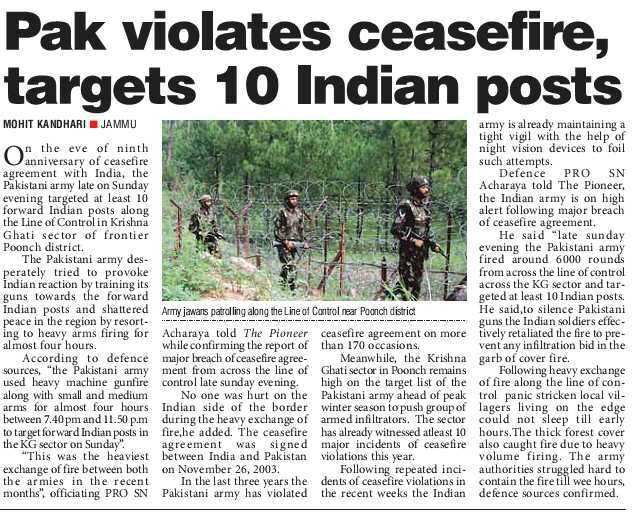 Indian army has been opposing withdrawal of its troops from the region. Indian and Pakistani troops are in face-off position in Siachen, where temperature falls to – 35-60 degree Celsius in winters, since 1984. According to media reports, about 10,000 and 20,000 Indian and Pakistani troops are stationed in the mountains above the Siachen glacier. Hundreds of soldiers from both sides have lost their lives in Siachen. Most have died because of inhospitable climate and snow avalanches and not because of enemy fire or shelling. The demands for demilitarisisation of Siachen were made early this year after an avalanche killed 139 Pakistani soldiers. New Delhi, Nov 26 (IBNS) In the wake of increasing threat to cyber security, the Indian Army has banned the usage of pen drives on Internet computers. "Union government is aware that cyber-crime is becoming a major threat to national security and armed forces are bracing to cope with the challenge. Usage of pen drive on Internet computers has been banned as a policy due to inherent security threat posed by pen drives," Defence Minister AK Antony said in the Lok Sabha on Monday. "Computers and communication systems in Ministry of Defence are procured from recognized Original Equipment Manufacturers (OEMs)/Companies as per the procurement procedures of the Government," he said. A Cyber Security Policy 2008 issued by the Ministry of Defence is under implementation, which inter-alia, includes continuous awareness campaign, audit of networks, strengthening of cyber security activities and maintaining of air gaps. "Cyber security issues are also coordinated by National Security Council Secretariat (NSCS) at the national level," he said. Four years ago, after the 26/11 Mumbai attack, the three service chiefs dashed off letters to the defence ministry listing out the equipment deficiencies that hamstrung their forces. Their barely disguised accusation to the politicians and bureaucrats: you have failed to equip us, so think carefully about what you ask us to do! Pakistani generals know well that the Indian Army is unfit to take the field against them. In making this bald statement, I give away no secrets. Every effective military intelligence organisation – and Pakistan we know has one – possesses devastating compilations of our army’s crippling shortage of tank ammunition; the night-blindness of our tanks; the absence of modern artillery; our obsolete air defence network; and shortfalls in practically every parameter by which an army’s equipment readiness is gauged. All this is kept secret only from the Indian people who faithfully support their army, sending sons and daughters to die for the country, often in unnecessary ways. Of course our army is fit for war, these patriotic citizens will say, pointing to the decades of counter-insurgency in J&K and the northeast that have claimed more soldiers’ lives than all the wars fought by independent India. But rolling back secessionism is different from fighting a full-scale war. All that is needed for counter-insurgency is excellent light infantry, and India’s infantry battalions are equal to that task. Kargil, too, was an infantry job, even if one that took all our reserves of 155-millimetre artillery shells to drive home. 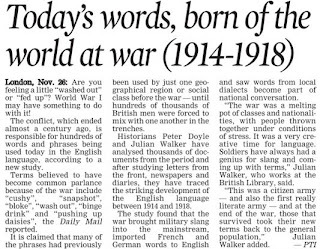 But full-scale war requires much more; and our mechanised forces, field artillery, air defence networks, combat engineers and logistics are woefully unequal to the task. This was true during the 1999 Kargil conflict; when India mobilised in Operation Parakram after the 2001 attacks on Parliament; it was true four years ago during 26/11; and it remains true today. But nobody looks at this cold-eyed, because the generals hide their shortfalls behind the heroism of the fighting troops. Go through the recent media coverage of the 1962 war and, astonishingly for such an abject defeat, the army comes out smelling of lotuses, floating beatifically in the mire. Jawaharlal Nehru, Krishna Menon and B N Malik are blamed for throwing our brave jawans under the Chinese bus! Could this have happened had the generals held fast? When army chief General K S Thimayya resigned in 1959, Nehru personally intervened to minimise the damage. If a chief were to resign today over equipment shortfalls, does anyone doubt the intensity of the political inquisition that would follow? 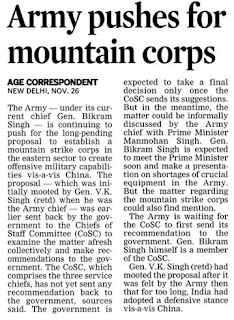 But there is a twofold reason why army chiefs do not resign or even thump their boss’ tables. Firstly, they seem unable to contemplate giving up power and the institutionalised perks and privileges associated with senior rank. Secondly, and this is crucial, the generals know that the military, far more than the bureaucrats and politicians, is responsible for the lack of war readiness. Take the deplorable state of affairs in the armoured corps, which operates the armoured tanks that are the cutting edge of India’s three strike corps. As this newspaper reported on Monday (“Army scuttles Arjun trials to push through T-90 purchase”, November 26, 2012), the army much prefers to buy equipment off the shelf from countries like Russia, rather than painstakingly developing and manufacturing equipment better suited for our own operating environment. Incredibly, the army has not developed an indigenous armour philosophy in the last 65 years. Every serious army, even Israel, designs its tanks around a custom-made philosophy. Since human resources are a key constraint in tiny Israel, and distances are small, Israeli tanks are heavily armoured, lumbering vehicles where crew protection counts for more than the ability to quickly move long distances. In contrast, Russian tanks, designed to sweep rapidly through the vast expanses of Europe, are mobile, lightly armoured and have a smaller, three-man crew since a tank is expendable. The Indian Army, with one of the world’s largest fleets of 4,000 tanks, has neither an armour philosophy nor a tank design bureau that can produce indigenous designs. The army has more generals than the Government of India has secretaries. But none, from the army chief downwards, has insisted on an armour philosophy, an essential prerequisite for an India-specific tank. Instead, the T-90 tank, designed and built for freezing Russia, is now being air-conditioned (heresy!) so that its electronics can survive the Indian summers. In an incredible moral contortion, those who back the indigenous Arjun are branded anti-national; while the generals who support the Russian T-90 style themselves as patriots! Crafting an armour philosophy is not an intellectual feat. Three bright armoured corps colonels could do it in a week, given inputs on India’s border geography; war termination objectives; likely adversaries; the army’s manpower profile; and India’s industrial capabilities. But generations of armoured corps generals have had better things to do with their time; successive army chiefs and directors of operations and planning have been too preoccupied, or simply unconcerned, to ask why this is so. If the army’s entire planning hierarchy has ever questioned the absence of any doctrinal coherence in the strike formations’ equipment, this has not resulted in any remedial action. But our generals believe the road to salvation passes through Moscow; respond to the challenge of indigenisation by buying more T-90s, just as the air marshals buy more and more Sukhoi-30 fighters. Does this point to Russia’s colonisation of our generals’ operational thinking, or it is just apathy and lack of professionalism? Either way, the answer is depressing. Nearly 4,000 soldiers have been killed in the country after the Kargil [ Images ] operations in 1999 while more than 390 Army troops have committed suicide in the last three years, Lok Sabha was informed on Monday. In a written reply in Lok Sabha, Defence Minister A K Antony said more than 25,000 Junior Commissioned Officers and jawans have proceeded on pre-mature retirement in the last three years. "530 soldiers were martyred during Kargil War under operation Vijay. 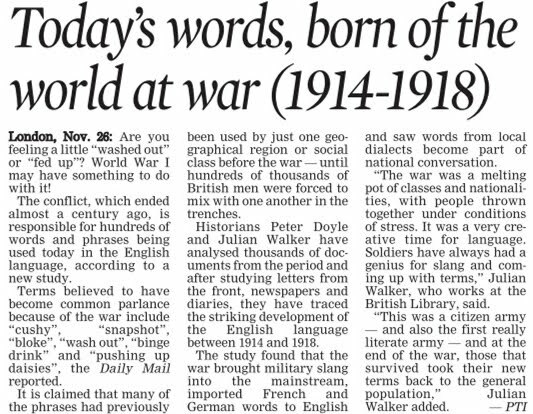 3,987 soldiers have been killed afterwards during the years 2000-2012," he said. The Indian Army [ Images ] is deployed in counter-insurgency and counter terrorist operations in Jammu and Kashmir [ Images ] and northeastern states for over two decades. In addition, they are also guarding the Line of Control [ Images ] (LoC) with Pakistan in Jammu and Kashmir. On suicides in the force, Antony said, "A total of 394 Army personnel committed suicide between 2009 up to November 20, this year." Recently, the suicide by a jawan in an armoured unit in Samba in J-K had led to a face-off between officers and soldiers after which a detailed court of inquiry was ordered. 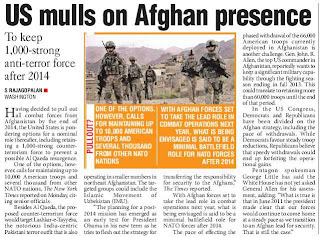 Antony said in last three years, 25,063 Army personnel have opted for pre-mature retirement. "However, reasons for seeking premature retirement cannot be attributed to stressful working environment," the Minister said. As per the figures provided by the Ministry, 7,499 personnel took premature retirement in 2009, 7,249 in 2010 and 10,315 in 2011. 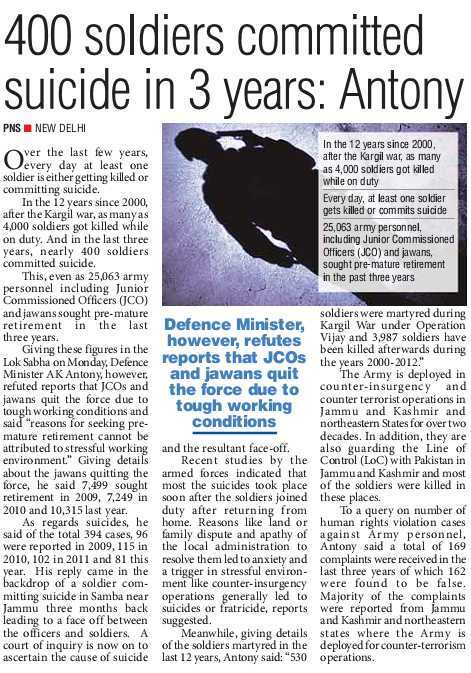 To a query on number of human rights violation cases against Army personnel, Antony said a total of 169 complaints have been received in the last three years of which 162 were found to be false. He said in 2009, 79 complaints were received from areas including the northeast, Jammu and Kashmir and other states and all of them were found to be false. Of the 90 complaints in the two subsequent years, 83 were found to be false and seven complaints were pending, he said. 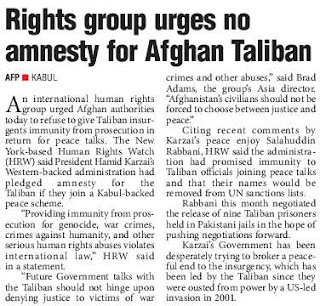 "Five complaints of 2010 and one complaint of 2011 are subjudice and one complaint is under process," he said. Majority of the complaints have been filed from Jammu and Kashmir and north-eastern states where the Army is deployed for counter-terrorism operations.